En studio avec nous invites the public to move with choreographer Anik Bouvrette and the dancers to explore the movement concepts that guided the creation of these works. 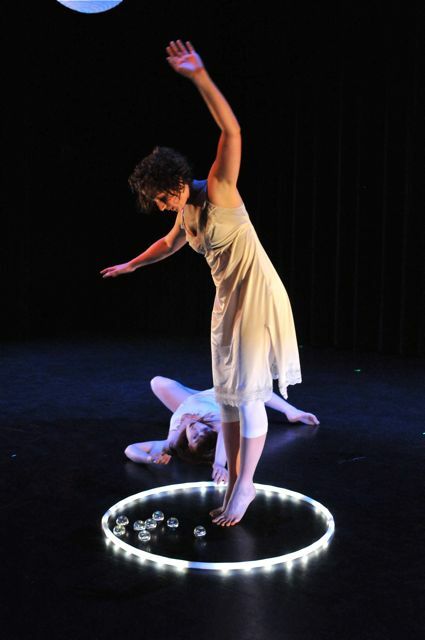 Les billes (marbles) is a poetic work, which presents a world born from choreographer Anik Bouvrette’s imagination, a world inspired by dreams and filled with curiosity, wonder, and light. It is a piece inspired by a game Bouvrette plays where she says, “When I close my eyes, in my imagination, I see…” Hippopotame is an improvisation-based piece performed to live music, which explores various concepts of movement in dance. Tara Luz Danse. Photo by James MacDonald.